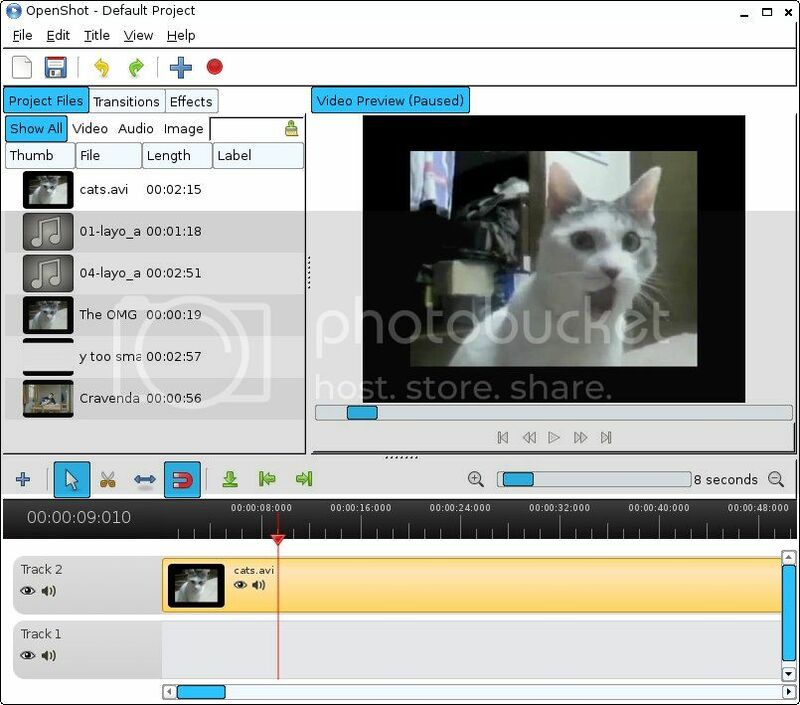 OpenShot Video Editor is a free, open-source video editor for Linux licensed under the GPL version 3.0. OpenShot can take your videos, photos, and music files and help you create the film you have always dreamed of. Easily add sub-titles, transitions, and effects, and then export your film to DVD, YouTube, Vimeo, Xbox 360, and many other common formats. Note: the help file doesn't work as it requires gnome i think... i'll look into it. i haven't tested everything, so please let me know if something isn't working and i'll try to fix it. Thank you so much ....seems working on Precise . But did not test further .
" openshot sh: /usr/bin/openshot: /usr/bin/#python: bad interpreter: No such file or directory "
How could one get it working on DpupExprimo . But nevertheless thank you . Is there any chance for Kdenlive on Precise or DpupEXprimo ? Trying your openshot pet now with python 2.7.3 .
an error, you need to investigate the correct way to install MLT. NOTE: Do not type the $ or >> characters in the examples below. bug at https://bugs.launchpad.net/openshot. Good luck! hi backi, is this in dpup? if so .. can you follow the instructions at the end.... type python in a terminal, then type .... import mlt and see if there's an error. I am using dpup . I am a linux newbee dont know what that mean maybe it gives you some information . tested in clean frugal install of precise to edit together a video for my dad. Worked flawlessly! (the first time openshot has ever been able to complete a video for me). I used a fair amount of effects/chromakey and cuts and it all worked. sorry backi, i've had no luck with getting it to run on dpup. what i need to do is get a blank dvd and burn a debian live dvd, install openshot on that, then look at the differences between that and the dpup install. Thanks for your interest !!! i'm having to give up on getting openshot to work properly on dpup. Whilst i could get openshot to start-up it wouldn't import any of the plugins, rendering it useless. so far so good . . .
. . . however . . . Seems like it could be working . . .
. . . 3D rendering is slow of course . . .
and we have videos to prove it . . .
Did you do what you did on Dpup or on which puppy ? Thanks for your goodwill .But if i need openshot i can use my precise puppy installed on Usb stick . But nevertheless i would like to see it run on Dpup too . The last Puppy I used Openshot was Slacko 5.3. For this micko (I think it was created) created and SFS which included Openshot and Python - so the devx was not required. The nvidia driver is now built into precise. Another step not required by me. I still find Openshot crashes and this may because 2GB is not enough ram - remember this is video. Maybe those with more stable results are using 4GB? Video editing apart from the very basic is not simple and I value Openshot as both simple, evolving and enjoyable to use. Fatdog64 contains a video package but I could not get to grips with the package even though it was more stable than Openshot on my hardware. my first test with this openshot was with my sons p4 system 3ghz single core processor with only 1gb of ram. I only edited sd quality on this and had to be patient but it worked fine. My second test was on my wifes dual core 2.7ghz system with 2ghz of ram editing 720i hd footage. Everything was nice and smooth. The important thing with openshot is to add all your footage to tracks then SAVE! I've read that openshot tends to grab memory with every action taken so I think that is why it crashes. Saving regulary and occasionally restarting (quick cuppa break?) seems good practice.